This photo sums up one of the best/worst years of my life. Sometimes you have to laugh or cry and thankfully I choose to laugh. Moving to London with no savings, no income and to start an unpaid internship, I naturally decided to move to the overpriced elite borough of Fulham. Full of millionaires and southern rah’s, a Yorkshire gal like me fitted right in…yeah. What myself and my two housemates once saw as a cute, cosy little house in a beautiful neighborhood soon become a rotting, damp, mouse-ridden hell hole barely fit for a family of rats. And once our landlord (a.k.a. Satan) had sucked our bank accounts dry at the rate of £650 a month each, we were left with nothing more than a workhouse’s pay to scrimp and survive on the mean streets of London. Our main priority after paying our rent, was of course funding our weekly night out. This proved hard at first but we soon found out that we could enter the likes of west-end clubs in a ‘promoters’ queue and stand around a table filled with vodka and gold-diggers without paying a penny! With nights out, however, come hangovers. Beasts which prove particularly difficult to tame with no money at hand. 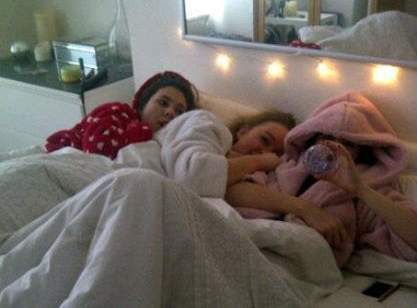 After our fridge stopped working, the entire bathroom wall turned black with mould and the heating was far too expensive to have on so we would spend our post-hangover days gathered in one bedroom. Primani dressing gowns in tow, we just about managed to make it through the evenings filled with warmth from each other’s laughter, body heat and Clare’s electric blanket. Food consisted mainly of a packet of 62p cous-cous mixed with everything and anything you could find, a variation for each night of the week – I liked to mix it up. And week nights were spent awaiting the weekend and going to bed early, just in case we didn’t have enough on our Oyster cards and had to walk to Central London to get to work. Times were tough but, in spite or perhaps because of this, each minute spent in that house was filled with the most fun I’ve ever had in my life. We laughed when we spent an evening trying to catch the mouse, we laughed when the neighbours complained from the noise and we laughed when there was nothing else to do but laugh. So whoever said money can’t buy happiness was right – because we had a ton of happiness but sure as hell no money! Fi is a Social Media Consultant living in Clapham Junction, thankfully no longer in the hell-hole. She has her own Social Media business and still works on the mean streets of London. Her main interests in life are cooking up delectable treats in the kitchen and wishing that one day she will fulfil her life long dream of swimming with dolphins. She no longer goes to west-end clubs or eats cous-cous but is still a huge fan of the electric blanket. I read this article and found it very interesting, thought it might be something for you. The article is called Living The Dream – #photographicmemory and is located at http://prancingthroughlife.com/2014/10/27/living-the-dream-photographicmemory/.